Pensioners and people with significant disabilities will need substantial help to switch to digital television, a nine-month government trial indicates. 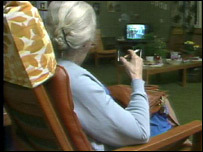 The study of 400 homes in Bolton found 74% still had problems adjusting four weeks after switching to digital TV. But after a further four weeks, it was fewer than 20%. And 98% were happy with the change in the long term. Starting in the Border TV region in 2008, the switch to digital TV should be completed nationwide by 2012. Once the analogue signal is switched off, every television and video recorder will need a digital receiver. The BBC will pay for help for the over-75s and people with significant disabilities. But 69% of households taking part in the trial were able to install the equipment themselves, or with help from friends or family.